Imagine yourself monitoring the surgery of a loved one from the comfort of your home. Or better yet, imagine swimming with dolphins while lying in the hospital bed. No, this is not science fiction! Virtual Reality has taken the healthcare industry by storm. For patients, VR is used in many areas of healthcare which range from diagnosis, treatment, e.g. surgery, rehab, and counseling. Furthermore, it is also used to train the next generation of doctors, paramedics, and other medical personnel and has shown a range of benefits from doing so. How VR is shaping medicine? Medical VR has fascinating possibilities. Scientists and doctors have been on the drawing board for years to find out the next generation of diagnosis, treatment, and care. Even though the field is brand new, there has been a considerable amount of work done to prove the fact that Medical VR is not just a fad but a technology which could drastically improve the quality of human lives. Here are 5 ways VR is shaping the healthcare industry. 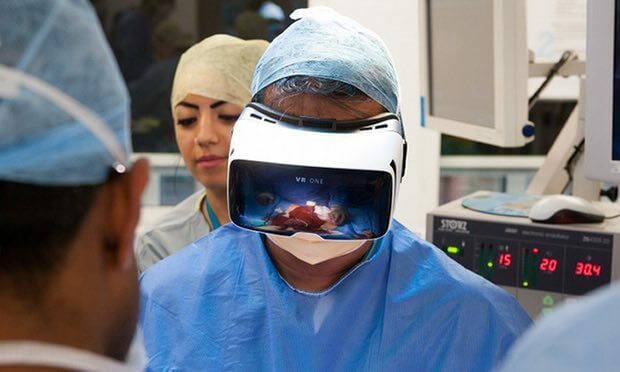 On 14 April 2016, British cancer surgeon and co-founder of Medical Realities, Shafi Ahmed performed an operation using a Virtual Reality camera at the Royal London hospital. Everyone could participate in the operation real time through the website and the VR app. The procedure was shot using two 360-degree cameras and a number of lenses. No matter whether a medical student in India, a journalist in Sydney or a nervous relative, everyone could follow how the doctor removed a cancerous tissue from the bowel of the patient. What it feels like to be sick? Did you ever wonder how it feels to grow old? Or how it feels to have your vision impaired, or recover from a heart-attack? The revolutionary “We Are Alfred” from Embodied Labs is trying to use irtual Reality technology to do exactly that. Everyone can become the hypothetical Alfred for 7 minutes, and experience how it feels to live as a 74-year-old with audio-visual impairments. Founder Carrie Shaw came up with the idea when she was trying to understand and perceive what was her mother’s experience with Alzheimer’s disease. The simulation takes about seven minutes and runs the viewer through six scenes of Alfred’s story — from a birthday party to a minor spill to a visit to the doctor’s office. No one wants to spend time in a hospital willingly and the experience can become more cumbersome and frustrating especially for small children. They miss their parents, friends, school, the soothing environment called home. A Dutch company, VisitU now allows patients to get in touch with their loved ones whenever and wherever they want. Through a smartphone and a VR app, VisitU makes it possible to be their for the special occasion or just catch up and spend quality time right from the hospital bed. The idea came from a survey on what parents really missed in the hospital. If you suffer from general anxiety, meditation is one treatment that helps you to keep the anxiety in check. A new VR app for Oculus Rift called DEEP aims to help users learn how to take deep, meditative breaths by making breathing the only control for the game. The app works with a band worn around the chest that measures breathing. The experience is that of an underwater world You need to continuously breathe to get from one place to another. The other benefit to the game is that it can be played without a joystick or controller as breathing is the only thing required to control movements. VR isn’t only limited to medical schools and pain management. Dentistry is another area that’s seeing rapid development in this field, HapTEL, which is based upon haptics (Greek for touch) in order to train new dentists. The VR dental chair includes a training scenario in which the student is shown a 3D set of teeth that they can work on. This allows them to perform a range of procedures and get instant feedback which enables the student to adjust their technique accordingly. Interested in Virtual Reality topic? Check also 5 things you should know about virtual reality.